I'm always so excited to share these seasonal word sets from Wood Creations with you! I had a lot of fun putting this Easter Wood Set together. There are a lot of cute Easter and Spring sets available at Wood Creations, so go check them out if you have a minute. Every set from Wood Creations arrives unfinished, and needs a little sanding around the edges. 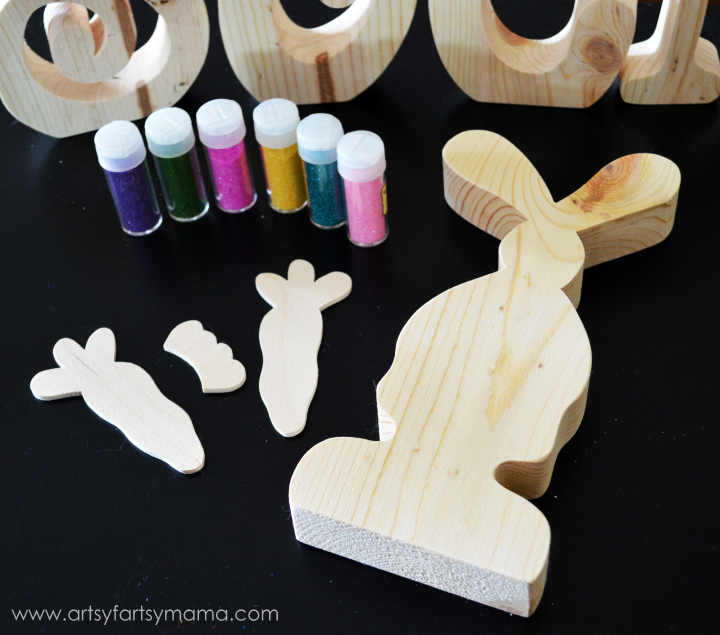 After some sanding, the letters were ready to be painted, and the bunny had some extra pieces to attach later. I used DecoArt Americana Acrylic paints on the entire set. Each letter & piece needed 2-3 coats of paint each. Any kind of brush will work fine, but I always go with the cheap sponge brushes and haven't had a problem yet! Let each coat dry completely before adding another coat, and let the last coat dry completely before moving on to the next step. Now for my personal favorite part - adding the glitter!! All you need is some Mod Podge (any kind will do) and fine glitter. I really love the Recollections brand (you can find it at Michaels), but any fine glitter will do the job. Keep in mind that paint can show through the glitter sometimes, so try to find a shade of glitter that closely matches your paint colors. Place the letter on top of a scrap piece of paper. 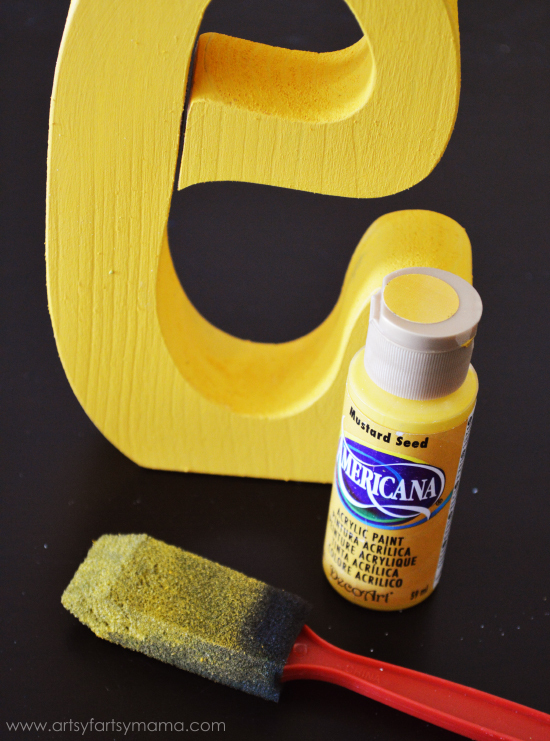 Then, paint a medium coat of Mod Podge evenly over the front of the letter. 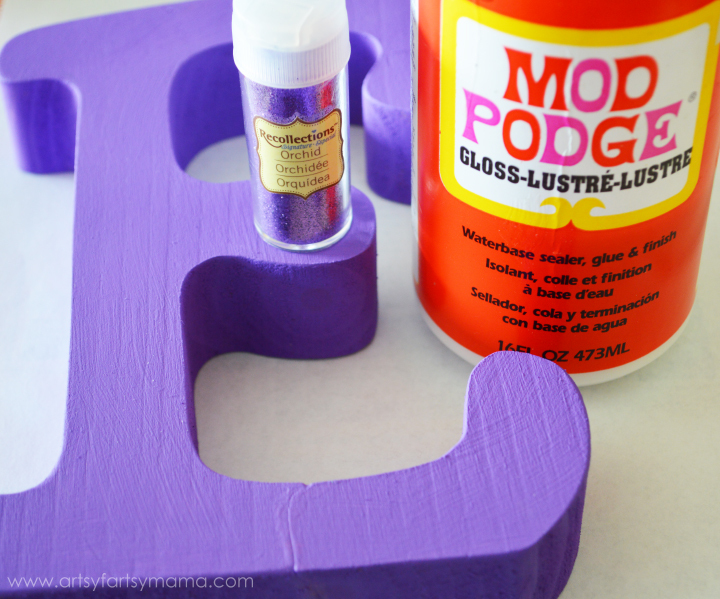 Pour your glitter over the entire letter, making sure that all the Mod Podge is covered. 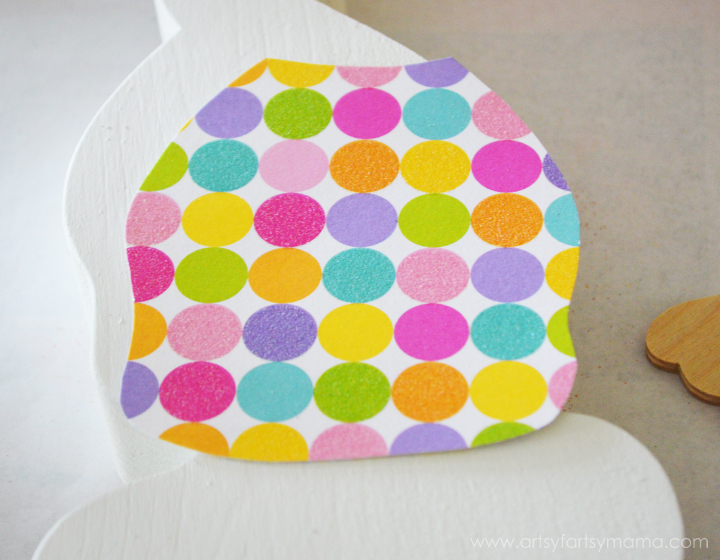 Wait a minute or two, and gently tap the glitter on top of the letter to press it down into the Mod Podge. By doing this, I've found to get a little better coverage. Carefully stand the letter up and tap it on the paper to remove any excess glitter. Repeat for all the other letters. Once you're done, let the letters dry for a few hours. 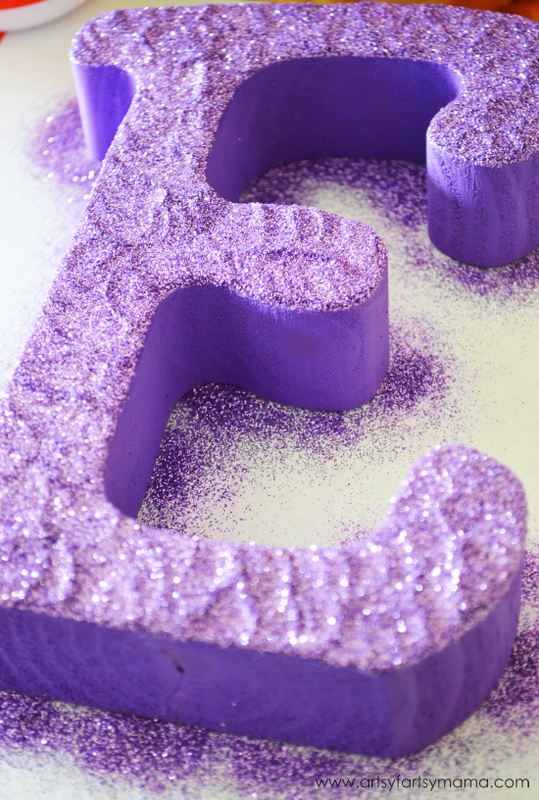 Then, you can spray the fronts of all the letters with a coat or two of clear spray paint to seal the glitter on. Now your glitter shouldn't shed all over everything!! For the rabbit, I painted the entire rabbit with white paint and let dry. Then, I traced the body area onto a piece of polka dot scrapbook paper and cut to fit the rabbit. Paint a light coat of Mod Podge on the rabbit's body and lay the paper on top. Press all over the paper to make sure it sticks and that there aren't any bubbles. You can also add a layer of Mod Podge on top to seal & protect the paper. 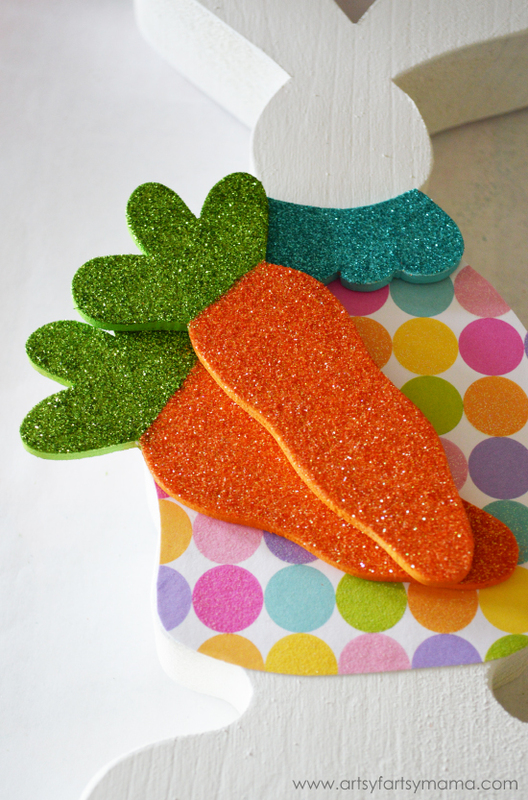 Paint and glitter the other rabbit pieces (collar and carrots) and glue them on with hot glue or E6000. Let the rabbit sit undisturbed until you are sure everything is dry. I also painted a triangle nose and inside the ears with Mod Podge and poured on some light pink glitter. Then, I used a Sharpie to add some simple eyes. Now the Easter letter set is complete and ready to put on display!! I absolutely love this set and can't wait to make some more last-minute Easter projects! Gosh I wish I was crafty! This is ADORABLE! Pinned! Absolutely adorable! I really love the bright colors! These little wood sets are so cute! Lindsay, the colors are so springy....the glitter is so fun and I love how you matched it up with not only the paint colors but the polka dot colors too! GORGEOUS!